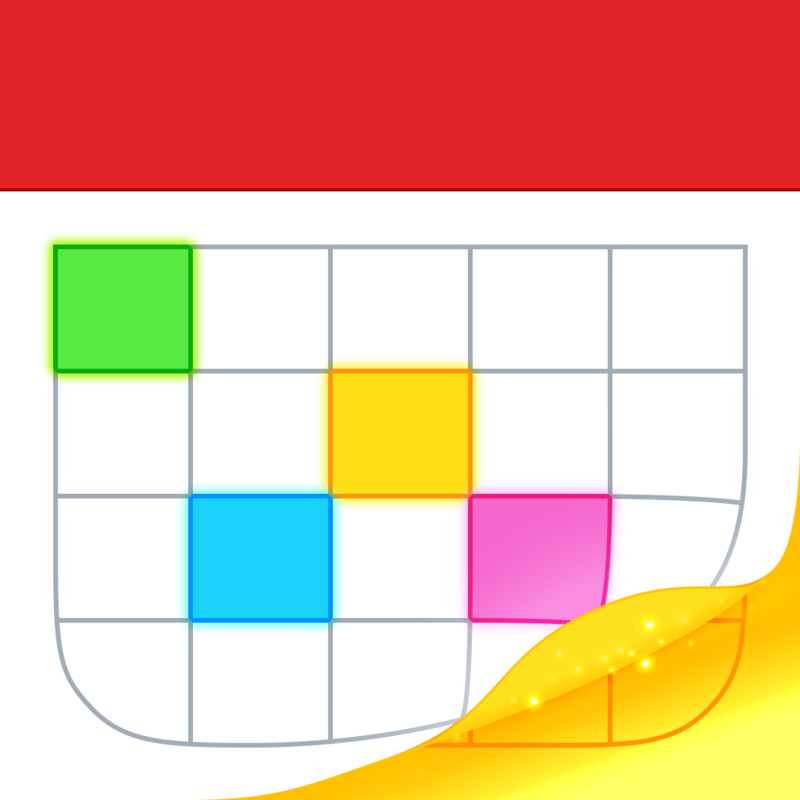 Fantastical 2 ($2.99) by Flexibits Inc. is the much anticipated iOS 7 revision of the popular calendar app. 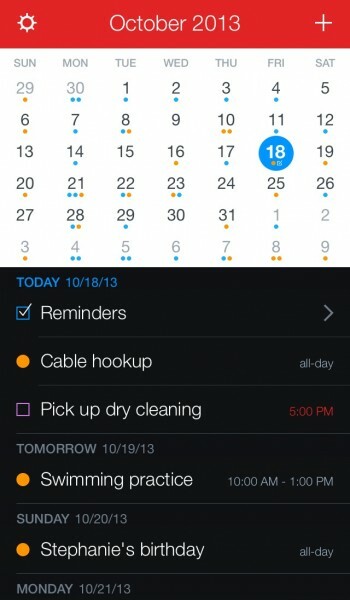 If you’ve been searching for the perfect calendar companion for your iOS 7 device, then look no further. I’m quite the productivity junkie when it comes to iOS apps. Believe me, I’ve pretty much tried them all (or very close to it). When Fantastical first came out on Mac back in 2011, I was drawn to it because it was a simple, out-of-the-way solution for viewing my calendar without having a big, clunky app open. It sat quietly in the menu bar, giving me the basic info I need to know at-a-glance, and then providing much more with just a simple click. Creating events was incredibly easy as well, since it uses natural language input. 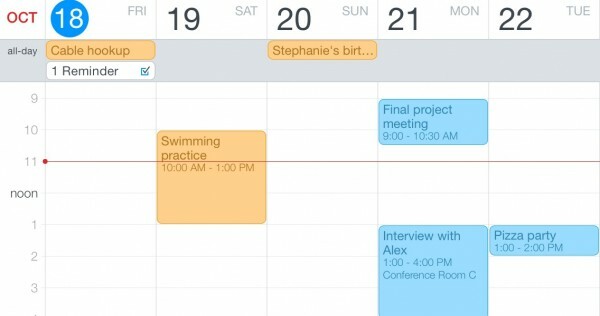 When it first came out on the iPhone, I grabbed it without hesitation — if it made calendaring such a simple task on my Mac, then it would do the same on the iPhone, right? Indeed, it became my default calendar app on my iPhone, even making its way to my home screen. 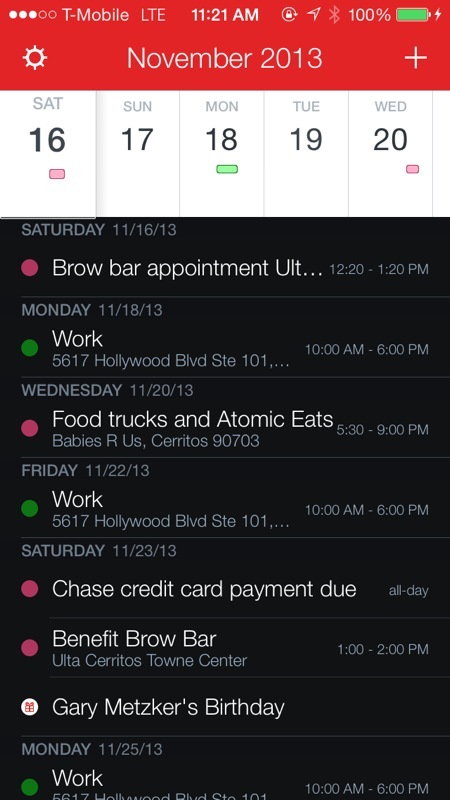 I loved the Day Ticker view, where I saw the week at the top, and then a list of all of my events underneath. If I needed month view, it was no problem — just pull the Day Ticker down a bit and it switches to month view instead, and vice versa to get back to the ticker. Creating events was fast and easy by just entering it with natural language, such as “Dinner with Corey this Friday at 8 pm at Ruth’s Chris Steakhouse,” which would fill in all of the details automatically. I loved everything about the app, and I really didn’t think it could get any better. That is, until Fantastical 2. 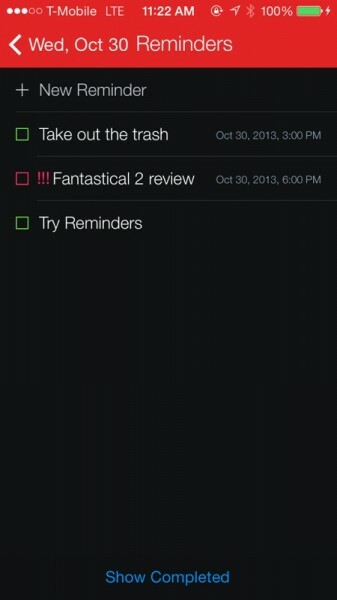 I’ve been in the beta for Fantastical 2 for quite some time now, and I have to admit, it has really impressed me. First off, the skeuomorphic stitching along the textured red header bar is gone, leaving behind a clean, tomato red bar that reaches up into the iOS status bar area. The entire app has been steamrolled by iOS 7, showcasing a flat design that is easy to read, and a blue circle highlight for the current day, which is a lot easier to spot than the previous dark red circle outline. 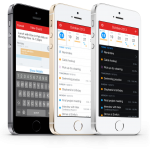 Not only has Fantastical 2 brought a brand new design to the table, but it also adds plenty of brand new features that are only possible on iOS 7. 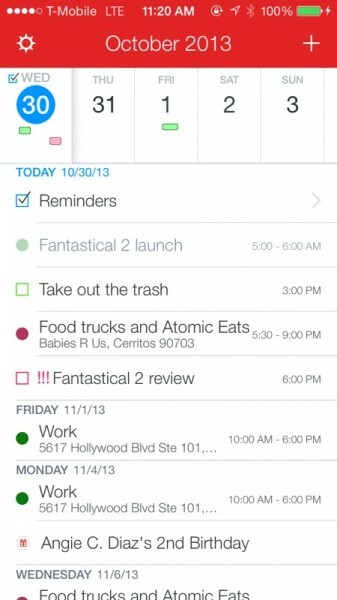 First, Fantastical 2 integrates Reminders into the app, so now it can be your calendar and task list. For the reminders feature to work, you will need to grant it access to your iOS Reminders app, but once that is done, you can view your existing tasks from Reminders, and even add new ones directly from within Fantastical 2. Reminders will always show up at the top of the event list when you are on today’s date in the Day Ticker or in the month view. 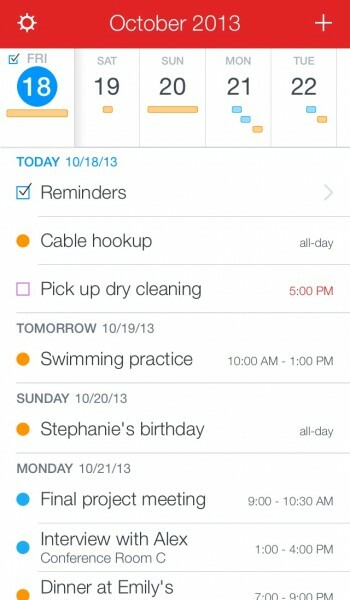 Tapping on Reminders will take you to the separate Reminders screen, where you can view them all together, or see them in your event list if they have a due date and time assigned to them. 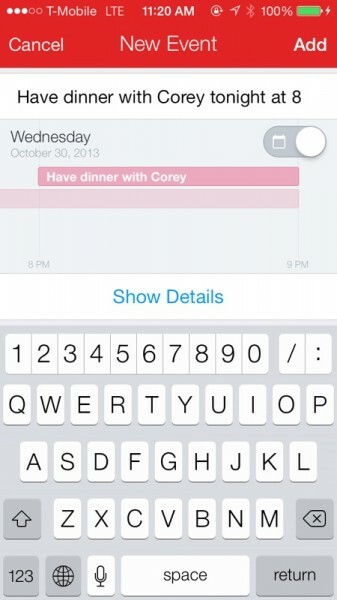 Adding new ones is done by going to the Reminders section and then typing it in the “+ New Reminder” text input field. Once you have added a reminder, you can tap on it to edit it in further detail, with stuff like reminders on specific days, at a certain location, priority, list (pulled from Reminders.app), and even a URL or notes if necessary. Fantastical 2 also has some slight modifications to the Day Ticker. Previously, the current day would be highlighted in the center of the week, and you could see the days prior and after today. Now, to make things simpler, the Day Ticker features today in the very left of the Day Ticker, and you can scroll through it horizontally or vertically through the list of events to change the days shown. To return to today, just tap on the top header bar where the month and year are shown. I am a fan of this revision, because I didn’t really care about seeing old days and events in the original. 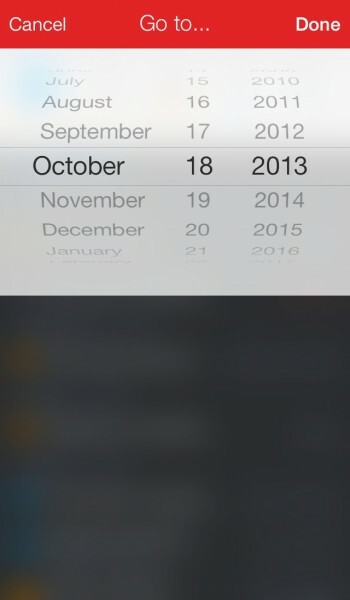 You can pull the Day Ticker down to switch to the Month view, or rotate your device into landscape to get a Week view. To get back to the Day Ticker, just put the phone back in portrait orientation or pull month view down. You can also reveal the search bar by pulling down on either Day Ticker or Month view, and search results can be filtered by title, location, invitees, or all, with results showing up in real-time. If you’re a busy person, then you may constantly be adding things to your calendar, perhaps even from other sources such as your computer. With Fantastical 2, there is also support for Background App Refresh. 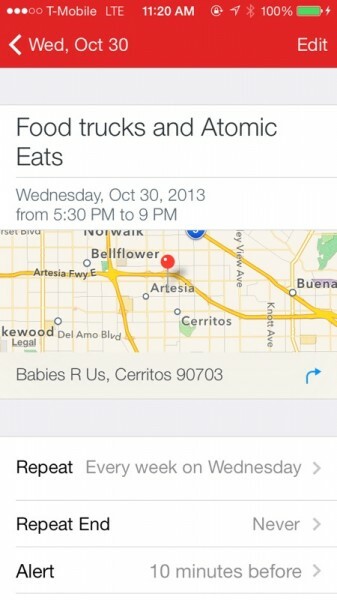 Your events, reminders, and even alerts will always be up-to-date and ready to go so you never miss a thing. For those who have an iPhone 5s, there is also support for the 64-bit A7 chip, so this will definitely be one of the fastest calendars you can buy on the App Store. Fantastical 2 will also make use of iOS 7’s Dynamic Type, so whatever size text you set in the iOS Settings is what you see in Fantastical 2. 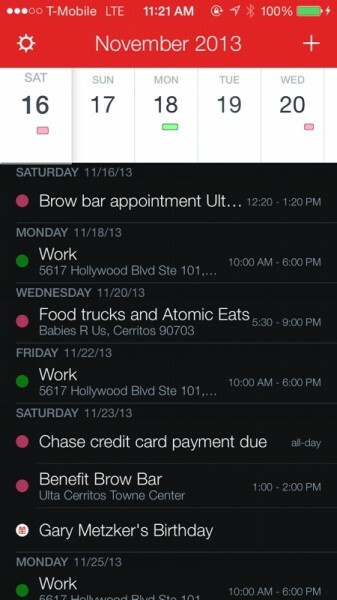 In addition to these appearance changes, Fantastical 2 brings along something new: themes. 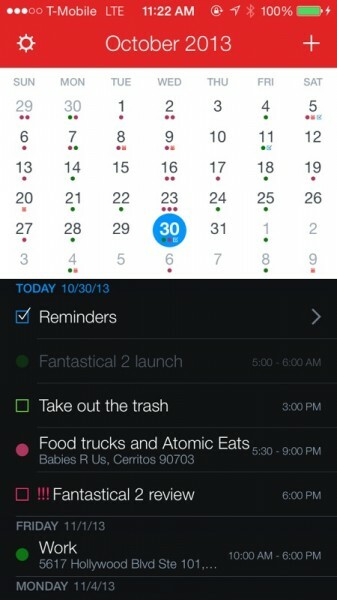 By default, Fantastical 2 will show you the classic-looking “dark” theme by default. If you were happy with this from the original app, then you may have little reason to change. However, if you’re like me and have a white iPhone, then you will be delighted to know that Fantastical 2 now has a “Light” theme, which can be toggled from the in-app settings. This changes the event listing area to white, and I’ve actually been preferring it over dark. And I don’t really need to look at my calendar at night, so having this on all the time doesn’t bother me too much. 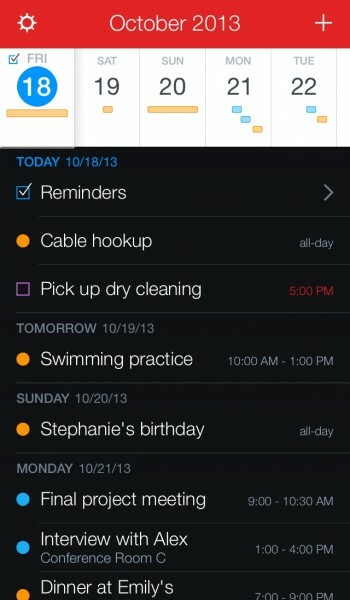 Now, what about adding items to your calendar or reminders? Just give that “+” button a tap, and input your item in natural language. 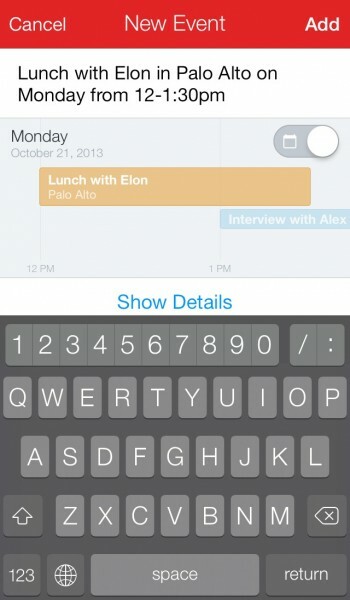 You can also easily switch between creating a new event or reminder by tapping on the toggle. For events, you will want to put something like “Meet Sandy at Starbucks at 2 pm on Thursday,” or “Have dinner with Corey at 8 pm,” and you can change the calendar that it ends up on by adding /calendarname to that sentence. 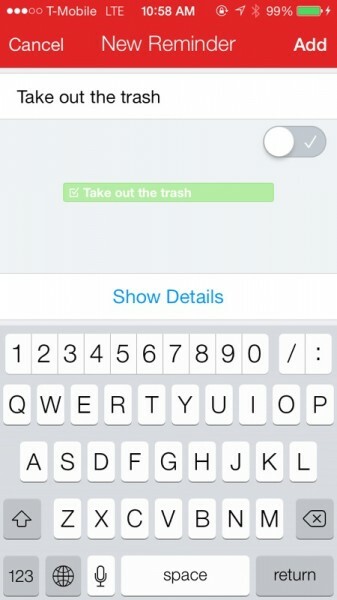 For events, just write in “Take out the trash at 3 pm” and it gets added to the inbox, or whatever list you choose. For fine-tuning details, you can expand the event or reminder creation screen to reveal all of the individual fields, and tinker around with them that way. Another bonus is the extended keyboard that features shortcut buttons for numbers and symbols for dates and times when creating new events. This is exclusive to devices that have a 4″ screen. I found the default settings to be pretty decent, but you can always access the settings and tinker around to your heart’s content by tapping on the cog in the Day Ticker/Monthly view. 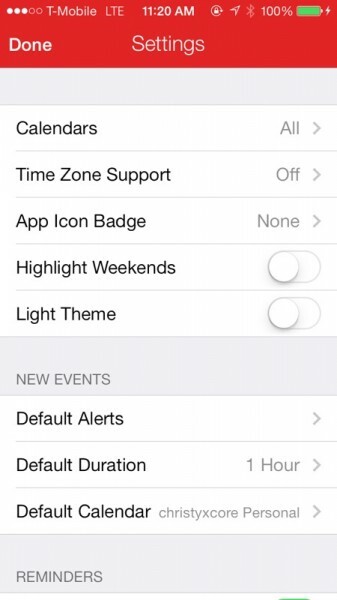 From here, you can choose which calendars to show, select the time zone, have an app icon badge, change defaults for alerts, duration, and calendar, and more. 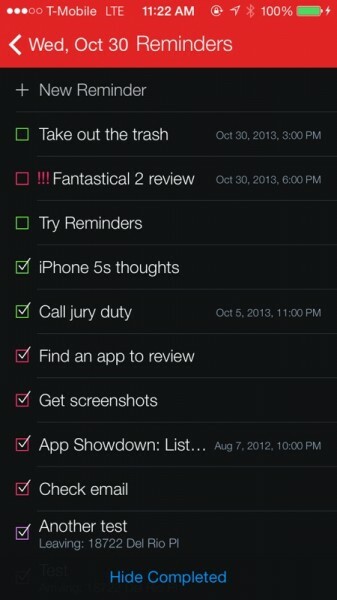 Fantastical 2 does not fall short of offering plenty of options for the user, as clearly shown by the vast variety of settings. I’ve been using Fantastical 2 for quite some time now, and it’s easily one of the best calendar apps that has graced my iPhone home screen. 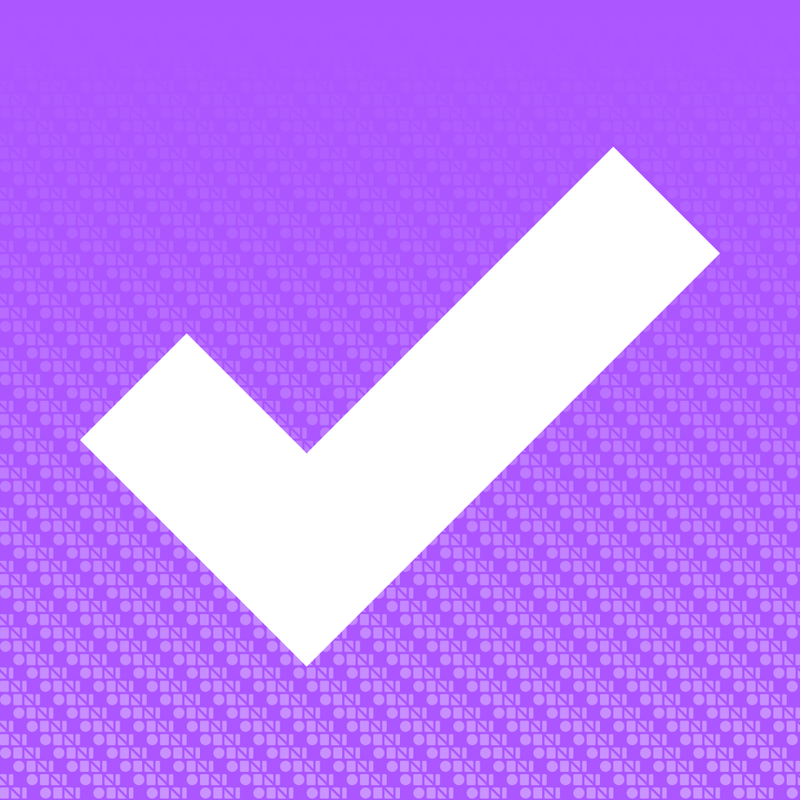 It’s fast, intuitive, looks great, and the new reminders feature makes it a complete and comprehensive calendaring and task solution (for simple things, anyway, I’ll stick with OmniFocus 2 for the more complicated stuff). I did not hesitate to purchase this one again, because it actually does add brand new stuff that wasn’t in the original Fantastical. 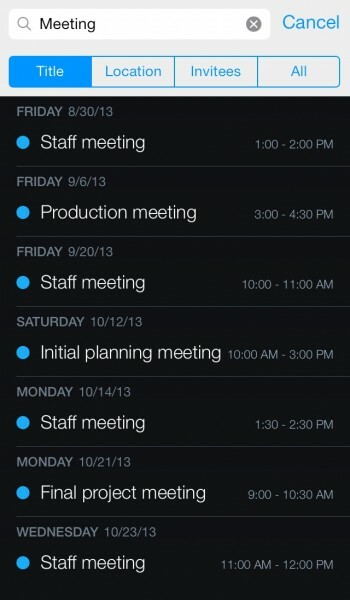 I highly recommend it if you are looking for a calendar app that is truly fantastic. 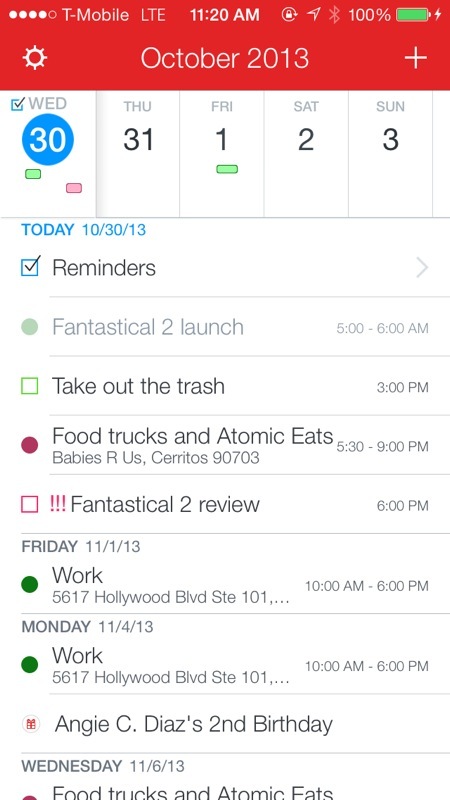 You can find Fantastical 2 in the App Store for your iPhone for $2.99, before it goes up to the normal price of $4.99.